Topping is a practice that removes large amounts of leaves and branches from a tree's crown reducing the tree's size. 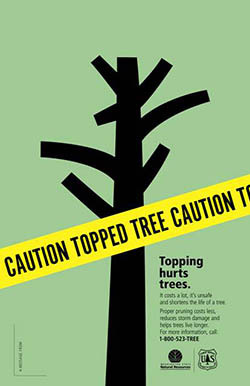 Topping involves indiscriminate (internodal) cuts without regard to tree health or structural integrity. Topping, also known as heading, stubbing, dehorning, tipping, and rounding over, is no longer an acceptable pruning practice. Topping removes large amounts of energy-converting foliage from the tree. This forces the tree to tap energy reserves to replace lost foliage, resulting in a weakened tree that is more susceptible to attack by pests and disease. Trees will send out or “flush” large amounts of foliage to replace the leaves removed. New growth is dense and may appear to be fuller. Unfortunately, new branches are poorly attached and break easily increasing storm damage and personal liability, and topped branches are open for attack by pests and decay. Some homeowners and tree care practitioners top trees whenever the trees reach an undesirable height. For some, they believe they are permanently reducing the height of the tree and reducing the storm hazard of falling braches, when in fact, topping has the opposite effect. People also top trees when they interfere with infrastructure such as utility wires, buildings, or views. A topped tree requires more maintenance due to increased pruning cycles. Ultimately, the tree will die prematurely, reducing property values, and will need to be removed and replaced. What Are Some Alternatives to Topping? The canopy of a tree may be thinned with proper pruning to allow more sunlight through, while not severely damaging the tree. For more information about tree selection and placement, please view our Right Tree, Right Place page. Carefully select the appropriate species before you plant a tree. Bear in mind the mature size of the tree and do not plant trees that will cause future conflicts with infrastructure, utilities, structures or views. If a topped tree is located under power lines that go from pole to pole, Tacoma Power may remove your tree by request. Contact Tacoma Power's Treeline at (253) 502-8729 or email. Contact an ISA Certified Arborist to properly prune your trees. Proper pruning can remove excessive growth without the problems topping creates. Enhance views by “windowing” or “crown raising.” “Windowing” is defined as removing several branches symmetrically within an area of the tree. By carefully choosing which branches to cut, and making proper pruning cuts, you can leave a window in a tree that provides a fully framed view and also maintain the health of the tree. “Crown raising,” or “skirting,” is the removal of lower branches to open up a view. To maintain a healthy tree, never remove more than 25 percent of the canopy of a tree at one time.